Editor's note: This feature is the second in BioPharma Dive's new series, Unblinded, profiling individuals who play central roles in the stories that matter to biotech and pharma. You can read the first, featuring Scott Gottlieb, here. In the risky world of drug development, few biotechs successfully mold a molecule into a viable medicine. Fewer still are able to repeat that feat. It's a challenge that Incyte, a Delaware-based drugmaker founded as biotech boomed in the early 1990s, knows well. "We have single asset syndrome," said Hervé​ Hoppenot, Incyte's CEO for the past five years, in an interview with BioPharma Dive. Jakafi, the company's first product and principal source of revenue, has fueled Incyte's rise since its 2011 approval. Last year, the drug reached $1.4 billion in sales. Finding a reliable second act, however, is proving a challenge. "The next big step is even more complicated," said Hoppenot. "How do you become a balanced, diversified company on a worldwide scale?" Incyte appeared to have its answer in a cancer immunotherapy called epacadostat. But last year a late-stage trial testing the drug in melanoma failed unequivocally, sending Incyte back to the drawing board. Another Incyte-developed drug, called Olumiant and licensed to Eli Lilly, faces crimped commercial prospects after U.S. regulators approved only a lower, less effective dose. Since then, Incyte has shifted gears. Two Incyte drugs could be filed this year for U.S. approval, and the company is poised to receive regulatory clearance for a new use for Jakafi by May. Even if successful in those efforts, Incyte remains a step behind the next tier of biotech companies. 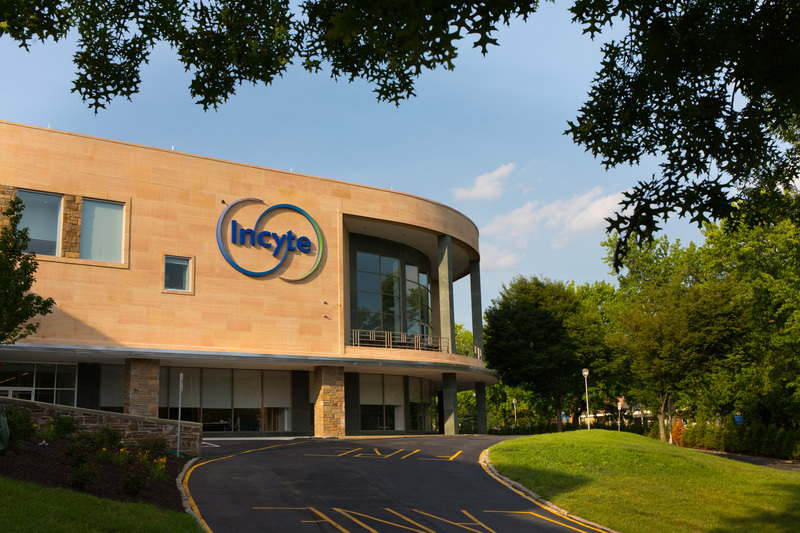 One blockbuster product notwithstanding, Incyte's annual revenues are one-fourth that of Regeneron, one-half Alexion's and three-fifths Vertex's. The market opportunities ahead of Incyte, meanwhile, are notably smaller than what the drugmaker might have had in its sights with epacadostat. Two years ago, at the 2017 annual meeting of the American Society for Clinical Oncology, enthusiasm for Incyte's immunotherapy approach was running high. Encouraged by alluring mid-stage findings, the biotech had forged ahead with an ambitious clinical development plan that bet epacadostat would be an ideal partner for top-selling immunotherapies like Merck & Co.'s Keytruda. "It was not a crazy or reckless approach." Analyst forecasts at the time called for nearly $2 billion in peak annual sales, and the drug was seen to account for as much as $10 billion of Incyte's then market value. Instead, data from the first of nine planned Phase 3 combination studies showed epacadostat to be essentially inactive, adding no benefit over Keytruda alone in metastatic melanoma. In hindsight, the evidence on which Incyte built its case appears a shaky foundation for a trial program that sought to enroll more than 6,000 patients across five cancer types. While Phase 2 results had suggested Keytruda plus epacadostat yielded improved response rates, that conclusion was based on single-arm data compared against separate studies Merck had previously conducted of Keytruda monotherapy. Hoppenot admits the negative results were a setback but, a year on, defends the decision to quickly move epacadostat forward. "It was not a crazy or reckless approach," the CEO said. "If that study had been positive instead of not, that would've opened a multi-billion [opportunity] for the company." To Hoppenot's point, Incyte estimates it spent about $50 million over two years for studies involving epacadostat and Keytruda, including that first Phase 3 trial. That's a significant investment, yet still modest compared to Incyte's roughly $1.2 billion in annual R&D spending. "Maybe people would say that's one strike, but he was right to be excited," said Tyler Van Buren, an analyst at Piper Jaffray who covers Incyte. A tree hiding the forest? Hoppenot's background is in cancer. At Novartis, where he worked from 2003 up until his appointment as Incyte's CEO in 2014, Hoppenot rose to become head of Novartis Oncology, overseeing a portfolio that included rights to Jakafi in Europe. Jumping over to Incyte, Hoppenot arrived just as the company began generating the early evidence that suggested epacadostat could help make checkpoint inhibitors more effective. Because of that enthusiasm, much of Hoppenot's first four years at Incyte were colored by the company's — and his — bet on epacadostat. "It was very difficult to communicate anything about the rest of the pipeline," Hoppenot said, calling epacadostat a "tree hiding the forest." Some of that was due to Incyte itself, as well as Wall Street. The company, for example, had touted epacadostat as a potential "cornerstone" of immunotherapy combinations. Now, with the drug written off, Incyte's remaining pipeline is the sole focus of company researchers, Wall Street analysts and investors alike. Rather than immunotherapy, however, it's Incyte's work in graft-versus-host disease — a potentially fatal complication of allogeneic stem cell transplants — that now commands the most attention. In GvHD, as the condition is commonly abbreviated, transplanted donor stem cells attack the healthy tissues and organs of the recipient patient. And, as more and more cancer patients receive stem cell transplants, the prevalence of GvHD has grown. Four years ago, a group of mostly German clinicians sought to confirm a hunch that ruxolitinib, the compound Incyte sells as Jakafi for two bone marrow cancers, could also work in GvHD. Results of that survey study, published in the journal Leukemia, showed impressive response rates, spurring Incyte to investigate on its own. A decision from the FDA on ruxolitinib's use in chronic GvHD that's resistant to steroids is due by May 24, and Incyte expects data from two larger Phase 3 studies of the drug this year as well. "What Jakafi tells us is that if you develop drugs, you should be very careful not to anticipate too much where the drug might lead you," Hoppenot said. "You may end up going in directions that nobody was anticipating at the beginning." Around 7,000 new cases of steroid-refractory GvHD, both acute and chronic, are diagnosed in the U.S. each year. Steroid-naive GvHD is an even larger market by Incyte's estimates and, there, the company has developed a JAK1 inhibitor called itacitinib. Unlike ruxolitinib, which is licensed to Novartis in Europe, itactinib is wholly owned by Incyte. Data from two late-stage studies of the drug are also due this year and, if positive, could support an application for approval. "If you take ruxolitinib and itacitinib, and you combine all of their indications, I think there's billion dollar potential there," Van Buren said. "The thing is, Incyte will have to develop these indications separately and layer them on over time." Incyte spends a lot on R&D, and not everyone is pleased about that. Last year, the company counted $1.2 billion in R&D expenses, or about two-thirds of what Incyte earned in revenues. That figure is down from 2017's mark of 86%, but still well above ratios posted by Regeneron, Alexion, and Vertex. Ran operating loss in 2018? Like most other biotechs, Incyte posted yearly net losses for decades before turning its first annual profit in 2015. Sharply increased spending on R&D, however, dragged the company back to a loss in 2017. Now that Jakafi is earning well above $1 billion annually, Hoppenot has faced increasing pressure from investors eager to see Incyte turn steady profits. R&D is Incyte's business, of course. But after epacadostat's failure, investors and analysts have more reason to ask how well Incyte is spending all that money. "I'm asked why are you investing as much as you do in R&D?" Hoppenot said. "The opportunity will be gone tomorrow. If you don't take it when you see it, it's a running horse." Hoppenot aims for Incyte to become a large, global biopharma in the next decade. For that to happen, a lot will need to go right, starting with the slate of drugs Incyte believes represent its future. An approval for Jakafi in GvHD would help, as would regulatory OKs for pemigatinib, a targeted therapy for a rare type of bile duct cancer, and capmatinib, a lung cancer drug out-licensed to Novartis. Whether together these drugs can solve Incyte's single-asset syndrome remains an open question. Convincing investors it's possible will require the company and Hoppenot to dispel some of the shadows left by epacadostat's failure.